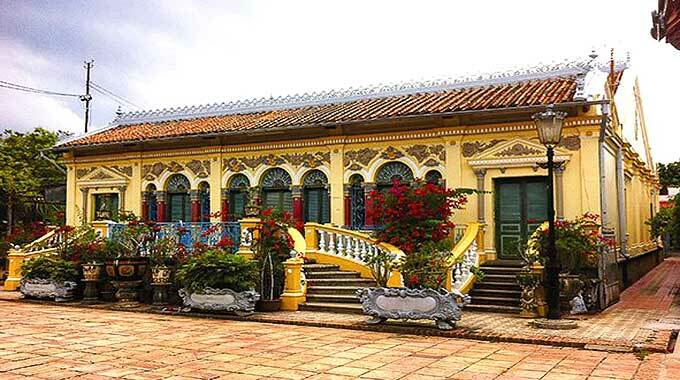 Can Tho City in the Mekong Delta has many attractive tourist destinations for those who love spending time in the countryside and the riverine region. Starting from Ninh Kieu Wharf and traveling along the Can Tho River to the upstream, tourists can visit two famous floating markets of this city which are Cai Rang and Phong Dien. While Cai Rang is a wholesale market, Phong Dien is where people retail agricultural products. The road bordering the north side of the Can Tho River, called Vong Cung Road, is lined by many tourist sites including Southern Truc Lam Zen Monastery, My Khanh tourist village and Giao Duong eco-tourism area, where visitors can explore the genuine traits of the south with fish farms, orchards and traditional craft villages. Tourists can travel by boat from Ninh Kieu Wharf at 7 a.m. or earlier to visit floating markets and orchards for one day. Those who love riding a motorbike can treat themselves with a more exciting trip. Starting from Cach Mang Thang Tam Street towards Long Tuyen Canal in the city, the first destination tourists should visit is Binh Thuy temple on the right side of Binh Thuy Bridge that crosses the canal. Built in 1844, the temple is a work of art and architecture of Vietnam in the southern reclamation process and is one of the most beautiful ancient temples in the south with yin-yang roof tiles and columns made of rare and valuable wood. Straight ahead, tourists can admire old French-built villas built, southern wooden houses and fruit gardens. Local people are friendly and willing to allow tourists in for a visit.